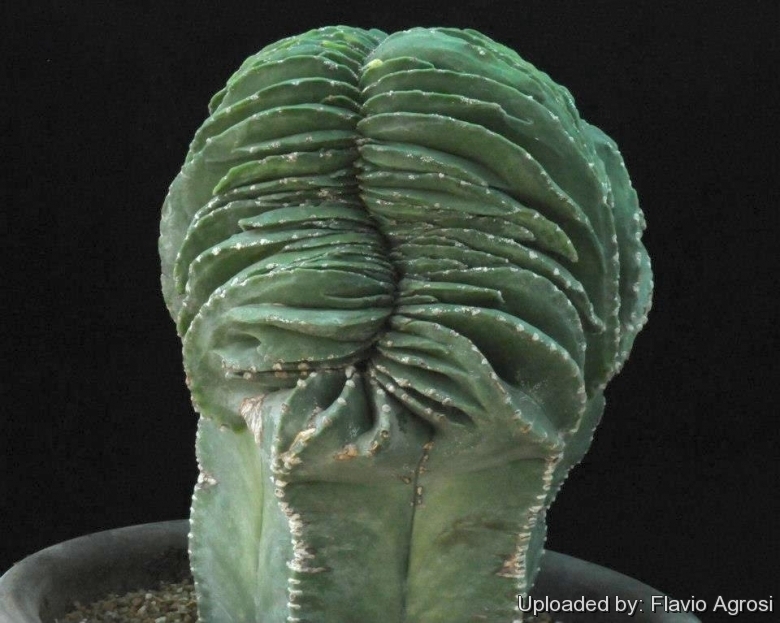 Description: The crested form of the Astrophytum myriostigma var. nudum, only deviate from the typical form for lacking or mostly lacking white flecks, giving a green colour overall. 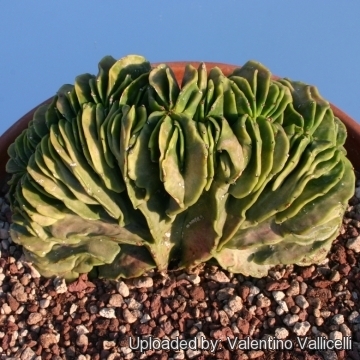 There are several crested forms mainly selected by Asian growers. Stem: Fan shaped, smooth, glossy green, blue-green, grey-green or mauve-green thin or thick (depending on clone) up to 30 cm (or more ) in diameter and height with age. Cultivation and Propagation: Although regarded as a choice and difficult plant is not too difficult in a greenhouse, although grows quite slowly. It is sometime seen as a grafted plant but grows very well on its own roots too. Use mineral well permeable mineral soil with little organic matter (peat, humus). Water sparingly from March till October (weekly during summertime, if the weather is sunny enoughand) , with a little fertilizer added. keep perfectly dry in winter at temperatures from 5 to 15 degrees centigrade. (but it is relatively cold resistant and hardy to -7° (-10°)C for short periods) In the rest period no high atmospheric humidity!! They need a good amount of light shade to full sun this help to keep the plants healthy, although slow growth.